This collection has been written by eminent members of the systemic communities to inspire reflexive practitioners and offer leading edge systemic research methodology with innovative approaches to systemic practice research. These practices of inquiry arise out of a comfortable systemic weaving of social constructionist, collaborative dialogical and narrative practices in the fields of therapy, consultation, teaching, supervision, leadership, organisational development, community work and activism. Reflexivity runs through this collection like a rainbow thread connecting the reader to different forms of practitioner research. The book connects theoretical, ethical and technical challenges for the practitioner-researcher offering a theorethical grounding in systemic inquiry alongside innovative examples of approaches to systemic inquiry. These writings encourage practitioners to find approaches to practice research rather than feel they must adopt existing methods from modernist academic discourse. This book is written for anyone interested in inquiring into reflexive and relational practice and has particular appeal to doctoral and masters research students. It is of practical and theoretical help in forging connections between systemic practice, systemic inquiry and the wider field of post-positivist qualitative inquiry. Very comprehensive and well presented review by Samuel Mahaffey here. "Systemic Inquiry. 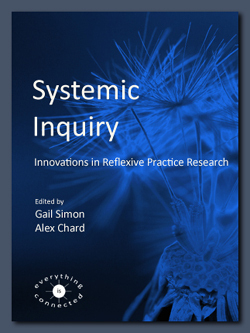 Innovations in Reflexive Practice Research" connects research, relationships and ethics in a thoughtful and meaningful way. For anyone interested in taking a systemic constructionist perspective to researching and theorizing practice, the book is a great resource, offering practical guides, a range of methods, along with helpful examples from the experience of authors who are carrying out research in a variety of contexts. What is also important is that each chapter illustrates the 'realities' of doing research - that inquiry is not the structured, de-humanised process many research methods books convey. Instead, it is often a messy, challenging, reflexive and ultimately rewarding experience." Frank J. Barrett, author of "Yes to the Mess: Surprising Leadership Lessons from Jazz"
"This collection is a hopeful reminder that reflexive research can be a powerful and transformative intervention in social life. What an exciting and important book!" "Wow! Here is a comprehensive bringing together of thoughts and practices involved in creating knowledge through doing systemic social constructionist research. A rich and inspiring resource for the practitioner. Enjoy your research activity!" "This important book has assembled leading thinkers and researchers to usher in greater coherence to the imaginative thinking that has emerged as the postmodern social constructionist shift is applied to practitioner research."